For months Conor has faced difficulty sleeping due to a recurring nightmare. To make matters worse, Connor is being visited by a monster who wants to tell him three stories. While Connor's mother is struggling with her treatments, Connor must tell the monster the truth about his nightmares. 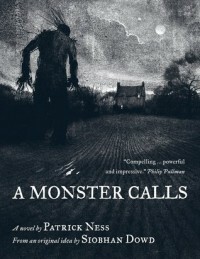 Patrick Ness beautifully spun a story that at times pushed me to tears. This was not because of the story, but rather the hidden truth that you do not want to face. The novel was mesmerizing and I could not put it down even for a moment (which is unusual for me). I went into this book believing that I was going to love it for one reason (the monster) but in the end I was taken in by another (Connor). This was a very surprisings story that left me guessing the outcome to the very end. I loved this story and the way that it was portrayed. This was my first introduction to Patrick Ness, but it most certainly will not be my last.